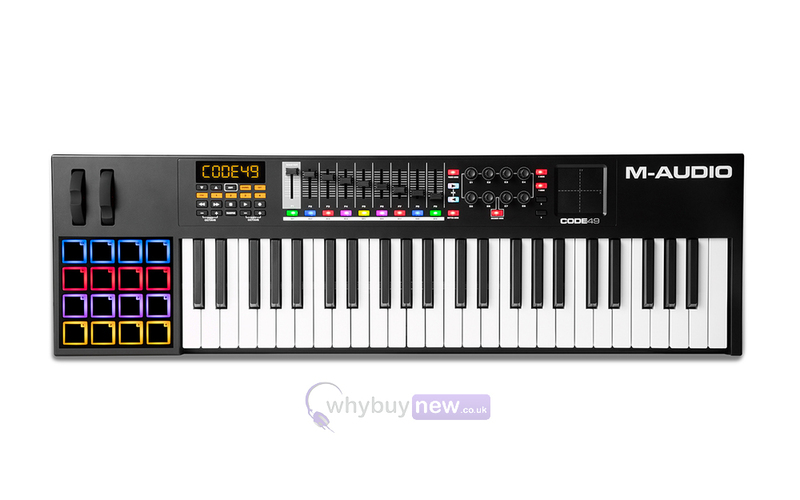 The M-Audio Code 49 (Black) is a 49-key USB MIDI Keyboard Controller with X/Y Pads, suitable for musicians and music producers. 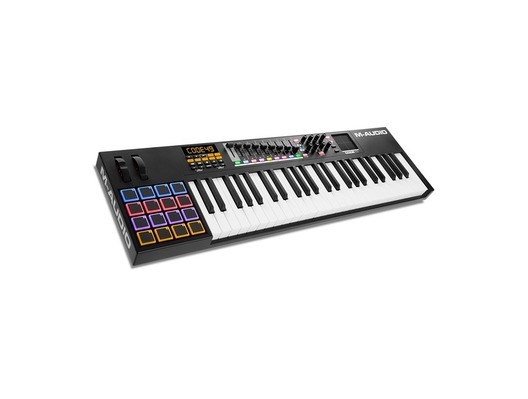 The M-Audio CODE Series of (Black) keyboard controllers, includes a pair of full-featured models, combining all of the production power and performance you need to get the most from your music software and MIDI gear. The CODE Series (Black) offers several thoughtful design touches that enable you to create and perform your best. A keyboard should not be an obstacle standing in the way of creativity. Instead, it should function as a direct extension of your thoughts ensuring that you convey musical ideas with immediacy, precision and clarity. All CODE Series (Black) keyboards-49 and 61 key models-have an all-new keybed with action that is clean, and precise. The natural profile keys are both velocity- and pressure-sensitive, for maximum expressive capability. CODE Series (Black) controllers are equipped with everything you need to produce some serious musical creations. Extensive assignable parameter control is a breeze with multiple banks of faders, knobs, buttons, pads and a smooth feeling pitch bend and modulation wheel. New to the line of M-Audio controllers is the X/Y Touchpad, which provides additional and direct interaction with effects and instrument plugin parameters across an X/Y axis - the ideal control source for effects and instruments loaded into Ableton Live's Audio and MIDI channels. In addition, the keyboards can be split into four assignable zones to maximize the flexibility and functionality of your setup. (ie: trigger four different instruments in their own separate zone, or overlap zones and trigger two instruments at the same time). Most every DAW uses keyboard shortcuts to execute common functions (like adding tracks, cut, paste, etc.). Now with support for ASCII/HID keyboard shortcut commands, you can map these commonly used shortcuts right to the controller itself, streamlining your workflow for a faster, more efficient and far more satisfying creation/production process. The CODE Series (Black) also supports Mackie Control/HUI control modes, so right out of the box you are ready to work with most DAWs with minimal setup. A comprehensive software package is included-Ableton Live Lite, Pro Tools First, 2GB Sample Library from Touch Loops and full versions of AIR Music Technology's award winning virtual instruments Loom and Hybrid 3.0-so you have unrestricted access to world-class creative tools. With VIP3.0, users can drastically enhance the creative capability of any standard MIDI over USB controller thanks to all-new MIDI Learn functionality. Now artists can seamlessly custom map the controls of their MIDI controller (knobs, encoders, faders, buttons) to VIP's parameters, for effortless integration and the enhanced workflow, attributes that owners of the award-winning Akai Professional Advance Series, M-Audio's CTRL49 and the Alesis VX49 have long enjoyed. VIP 3.0 is now available for the first time ever as a no-charge complimentary upgrade to owners of the Akai MPK2 & MPK Mini Series, M-Audio Code & Oxygen MKIV Series and M-Audio Axiom AIR Mini 32. 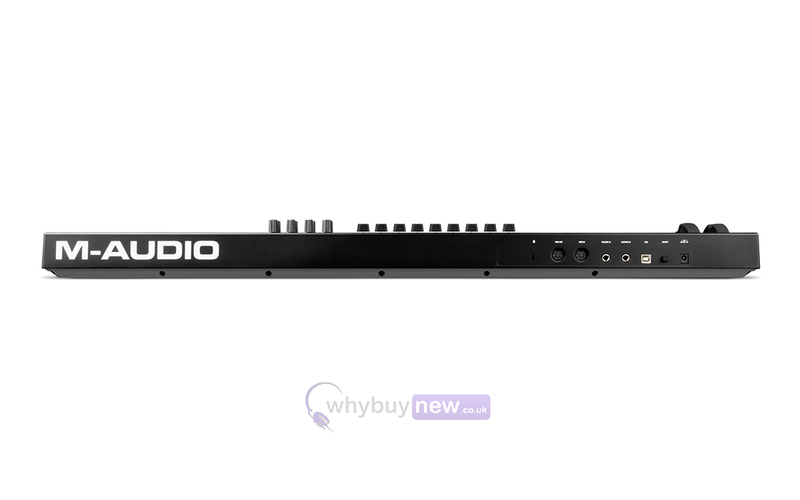 Here we have the M-Audio Code 49 (Black) in brand new condition and in B-Stock. The B-Stock versions would have been on display at a training evening or trade exhibition only and will come boxed 'as new' with all accessories and a 1-year warranty. 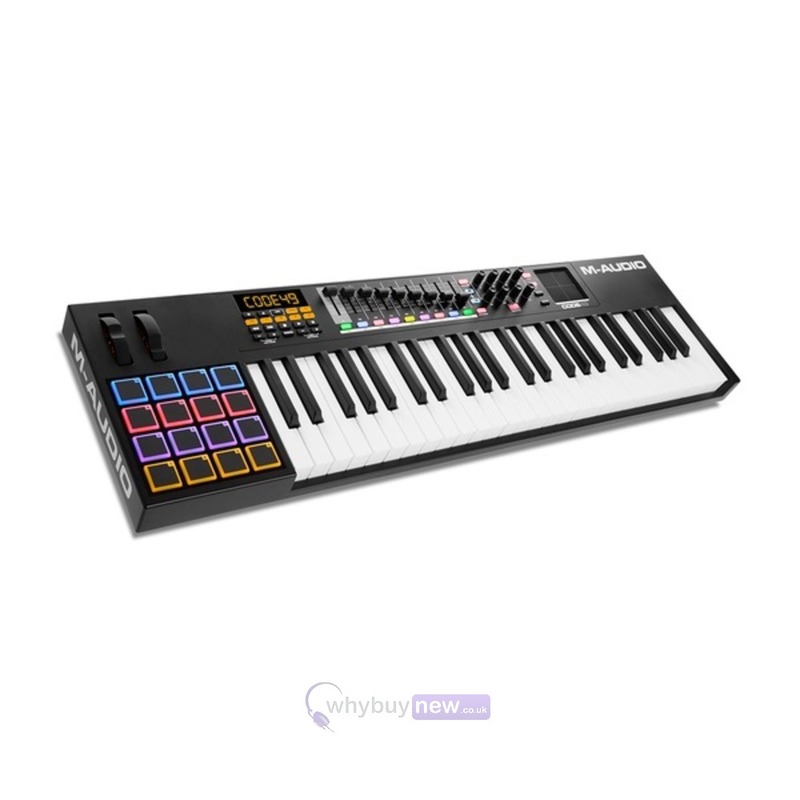 49 full-size, velocity-sensitive keys with aftertouch and four assignable zones for splits and layering. NEW | Key Control modes: play scales, harmonized chords or chord progressions from a VIP keyboard or MIDI keyboard.